Born in Stirling, Scotland, the first record of Bennie seems to be in the 1851 Census of Scotland, when he was recorded as a 20 year old MA student living in the St. Mungo area of Glasgow (close to the original buildings of Glasgow University). By the time of the next census in April 1861, Bennie was living in Curzon Street, London, and serving as Curate at the nearby Curzon Street Chapel. He was listed as a widower, living with his mother, a sister and twin daughters aged under five years old: Mary Jemima and Elizabeth Agnes, born in Middlesex. Their mother’s name was Mary Bennie and her death had been recorded in Middlesex in the last quarter of 1856, so it seems that she must have died during or very soon after childbirth. No record of her marriage to James Bennie or of her maiden name has been traced in any of the records of England and Wales, so it seems likely that they were married in Scotland. 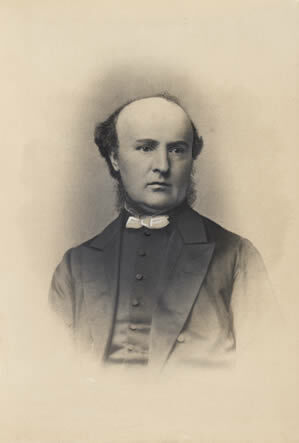 Later in 1861 he was married for a second time in St. George’s Parish Church, London, to Madeline Laye Dickson, born in Cheltenham in 1836, the daughter of an Edinburgh-born London physician, Samuel Dickson MD (Glas. ), MRCS (Edinb.). This marriage was to last for the whole of the remainder of his life. Very soon after the marriage the family moved to Leicester on Bennie’s appointment as Vicar of St Mary’s De Castro, living in the medieval Vicarage in The Newarke (almost certainly the Dean’s House of the important medieval Royal Hospital and Choral College of The Newarke). He served as Vicar of St. Mary’s from 1861 to 1873 when he was appointed Rector of Glenfield, Leicestershire, holding this office through to his death there in 1899. Bennie seems to have had some significant influence or contacts in Leicester before, or at least on, his arrival towards the end of 1861, as might be inferred from his appointment as President of the Lit and Phil within less than two years of his arrival. footnote to the list of incumbents displayed in St. Mary De Castro church states that Bennie was “a descendant of the Noble family of Westcotes Hall”. However, the Noble family was in fact associated not with Westcotes Hall, but the nearby Dannet’s Hall in what is now known as the Westcotes (or West End) area of the city. (In 1855 Dr. Noble of Dannet’s Hall allowed the Corporation and the Lit and Phil to carry out excavations to try to find the important Roman remains found in the 18th century including the large “Cherry Orchard” mosaic pavement and then covered up again, and donated the finds, including this mosaic, to the Museum.) However, while the Revd. Bennie’s middle name of “Noble” might indicate some family connection no documentary evidence of this has so far been found.Sources: UK census and births, marriages and deaths records; list of former incumbents in St. Mary De Castro Church (courtesy of Jenny Marriott).